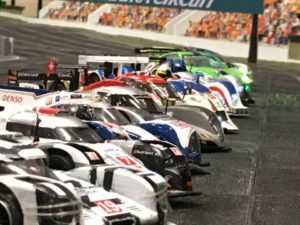 These standards are applicable to 1/32 scale models of Le Mans, endurance, and sports racing cars competing in race distances of greater than one hour, or where a team of drivers is necessary. They provision for hand-out motors and tyres and encourage the building of accurate scale model racing cars. The formula is designed for multi-category racing where cars on track are divisible into categories based on their type and/or technical specification, and that may be classified independently as such. The technical regulations allow freedom in many areas while requiring a plastic chassis and ‘hard’ bodyshell. Particular focus is directed at the scale authenticity and appearance of models. ERROR: Error validating access token: Session has expired on Thursday, 04-Oct-18 08:02:04 PDT. The current time is Saturday, 20-Apr-19 17:50:37 PDT.